Faced with the challenges and constraints of the 21st century, managers have to adjust their roles and attitudes. 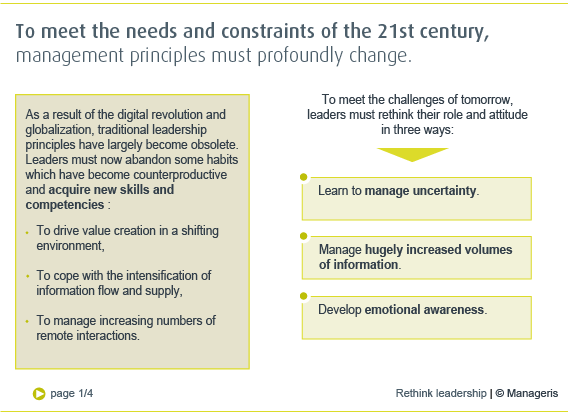 How to adapt leadership to the demands of the working world of the future? 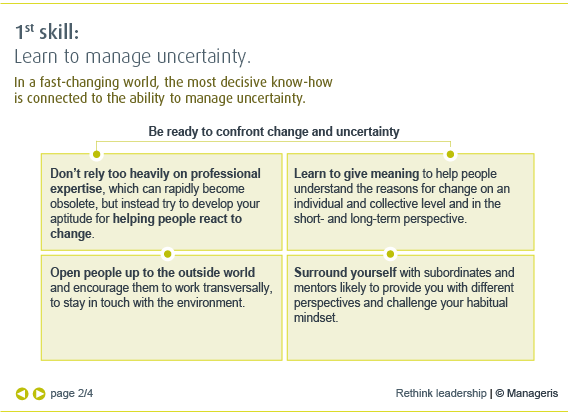 ¬ How can you act as a leader in an uncertain world? In the coming years, business leaders will be forced to face challenges for which they are ill prepared. For the past century, management has essentially focused on eliminating error and securing production. Nowadays, however, Google delivers beta versions of its applications to volunteers who are often only too delighted to suggest improvements. The rise of networks and interconnectedness has erased traditional dividing lines and brought together formerly separate worlds. Leaders must thus learn to manage their participation in many different communities and create value in a more open and uncertain context. Such changes require both unlearning obsolete skills, such as certain planning reflexes, and developing new skills, such as agile project management. Managerial roles and attitudes must also be rethought in the process. Executives, talent managers and professionals at every level of the organization must recognize the emergence of these new demands. Indeed, the individual and collective price for ignoring them is reduced employability for managers and poor adaptation to business conditions for companies. - Learn to manage uncertainty for yourself and your teams. 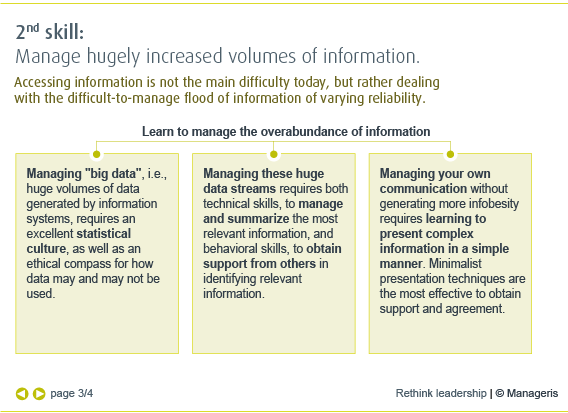 Because it is risky to rely too heavily on knowledge or expertise which may become obsolete, managers must learn to support their teams in turbulent times. - Learn to manage exponentially growing volumes of information to avoid being submerged and distinguish the essential from the secondary. 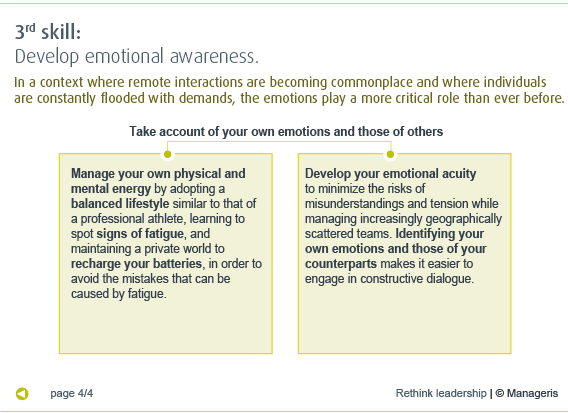 - Pay attention to your emotions to manage the stress which may be generated from a barrage of demands and interact effectively with increasingly scattered counterparts. How can you take (or keep) control over your development plan so as to develop the critical know hows that tomorrow's managers will need. How to exploit the opportunities offered by Corporate Social Networks (CSN)? Ten key skills to cope in a fast-changing environment. Six leaders share their vision of the leader of tomorrow. A look at the concrete organizational impact of globalization, demographic trends and new work habits.